Get the server back up! Love the idea. The rapid "insta-shot" the enemies have might be a little harsh, and I certainly second the wish for some feedback indicating which terminals I've gotten. Still fun to play, and quite enjoy the choice of music. Made it to the victory screen, phew! The terminals need some form of visual feedback to indicate that it's been activated. The hit scan shooting is really ridiculous as once you approach the central corridor its just a mad dash before you die. The lighting might be intentional but its kind of dark to make out any detail which is kind of a shame because the modelling looks pretty good. The BGM matches the gameplay pretty well but is kind of loud compared to the sound FX. I have mixed feelings about this one. 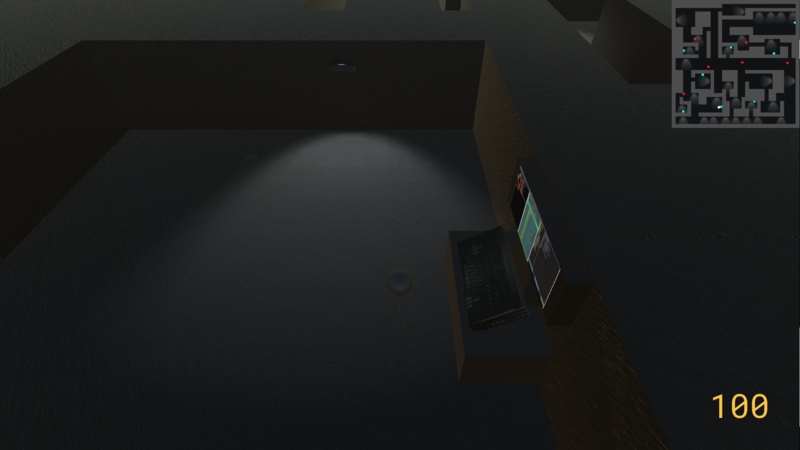 The concept is hilarious and I like the idea of navigating a maze to get to terminals while not getting shot (and the music is well-chosen). But the execution is seriously flawed. I'll ignore the fact that the player character face only one direction no matter where you move--I assume you didn't have time to make him turn completely. It's the fundamental design of this game that needs improvement. For starters, it's very easy to come across enemies and get heath sapped out of you (and they chase you quite a distance before giving up). 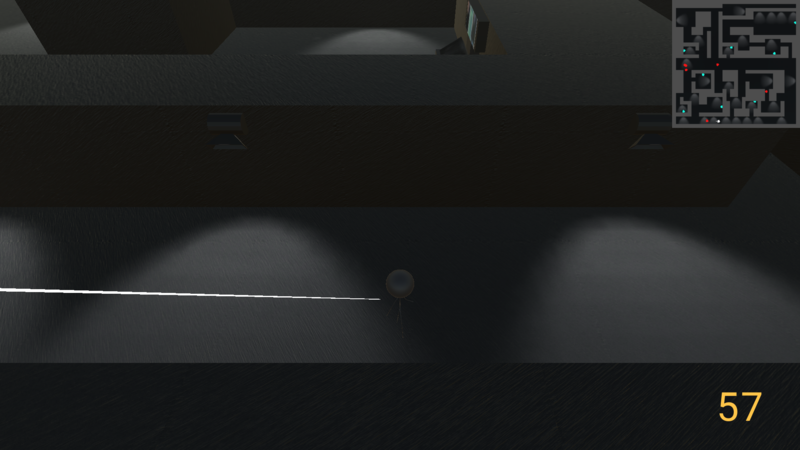 At first I assumed the lasers marked where the enemies would shoot and you had to get out of the way--but then I realized that no, the lasers marked where they shot, giving the player no time to avoid getting hit. 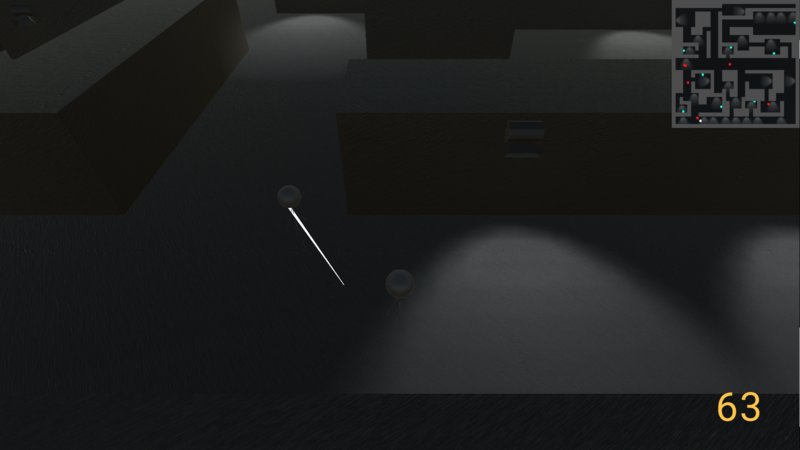 And the movement speed is fast enough for getting around, even the the animation makes it feel slow (and it's very hard to see the player character's arms and legs unless you're under a light), but the player character can't avoid the shots in the closed hallways & rooms--which is where most of this game takes place. The idea of navigating a maze to get to terminals is a good idea--but this "maze" is not designed well. Too many areas only have one very specific entrance point, and dead ends are common (what is with that dead end on the top-right corner--it doesn't even have a terminal!). Also, when you get to the terminal and press spacebar, the sound that plays is very quiet compared to the music, and there's no visual affirmation of your actions (the minimap's terminal doesn't change nor does the terminal on screen change). 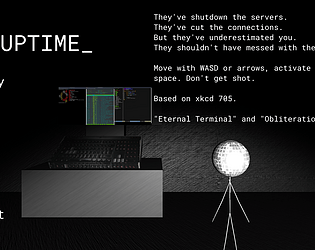 The player has to make a mental note of their actions, and hope they don't accidentally go to a terminal twice. 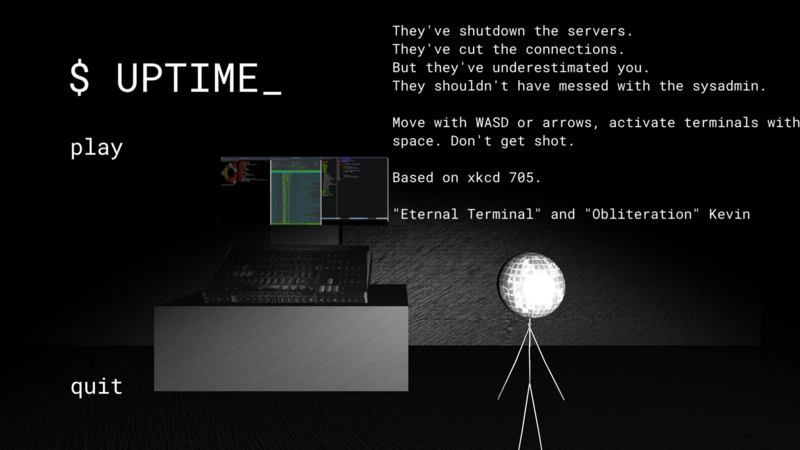 Not that I personally found out, because I died too many times and gave up before I got to all the terminals. The game's design (enemies shoot quickly and it's hard to avoid getting damaged in the closed areas) prevented me from completing it. There are also vents scattered around the map--I assume the player character was supposed to crawl through them as a shortcut, and this feature was dropped because of time? This really would've helped the game. Overall, this is ok. I want to see a better version of this after the jam; it has potential, but the design is quite flawed at this stage.